Every Sunday, my clever husband offers me a “day of rest” by writing posts on the subject of his primary ministry, Creationism vs. Darwinism, which is a subject that has broad reaching scientific, social, and metaphysical implications. For both believers and non-believers alike, the primary purpose is to present scientific, historical, logical, and/or sociological data in an empirical fashion, as much as possible written in layman’s terms, and in a format suitable for supplementing any homeschool curriculum whether you choose to believe the Biblical account — or secular guesses — about the origins of human life on earth. 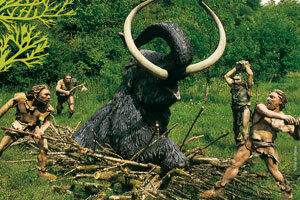 Where Have All the Cavemen Gone? The first introduction many children have to evolution are pictures of dinosaurs and cavemen. It is true that there have been groups that have lived in caves. They wandered from warm climates to colder ones and chose to live in caves for a time before building themselves homes in a new land. But the fact that some people lived in caves for awhile does not prove evolution from one species to another. Diodorus Siculus, writing about 60 B.C., told of people living along the shores of the Red Sea in caves. He describes many other barbarian tribes, some of them quite primitive. Thus we see that both advanced civilizations and more backward cave cultures lived at the same time. We have no reason to conclude that the less advanced peoples were ancestors of the more advanced ones. Archaeologists tell us that, in some places in Palestine, people resembling the Neanderthal race lived in caves while not far away in Jericho people dwelt in well-built, beautifully decorated houses. That is true, and also places “cavemen” and human beings living in similar locals at exactly the same time. This contradicts the notion that human beings evolved from those so-called “primitive” cave dwellers. The concept that we are just animals, only slightly removed from apes, means that there are no moral standards, no laws worth obeying, no future, and no hope. It means that we would be better off operating from the cradle to the grave based on instinct and biological imperatives, doing whatever is necessary for survival. The realization of this consequence even penetrated the gloom of Charles Darwin’s mind at times. “With me the horrid doubt always arises whether the convictions of man’s mind, which has been developed from the minds of the lower animals, are of any value or at all trustworthy. Would anyone trust in the convictions of a monkey’s mind, if there are any convictions in such a mind?” Charles Darwin, as quoted in Francis Darwin (ed. ), Life and Letters of Charles Darwin (1903; 1971 reprint), Vol. 1, p. 285. As adults, we frequently hear reports of fossil remains of apelike humans that have been found. Each discovery has been hailed as a landmark proof of the theory of Darwinian evolution. Scientists have given a name to these supposed half-man/half-ape remains; they call them hominids. Is it really true that such skeletal remains of evolutionary missing links have been found? Are we really related to apes? Did man arrive from monkey? Or is it all just one big ongoing fraud? In 1868 a large cave was discovered at Les Eyzies, in the Dordogne area of France. In the local dialect, cro-magnon means “big hole.” A number of skeletons have been found there, and have been hailed as the great “missing link” between man and ape. Cro-Magnons were fully human. Some stood over six feet tall, with a cranial volume somewhat larger than that of modern human beings today. This means they had more brains than men have today. Not only did they have some excellent artists among them, but they also kept astronomy records, wore jewelry, and buried their dead. The Cro-Magnons were normal people, not monkeys; and they provide no evidence of a transition from monkey to man. In 1921, Rhodesian Man was discovered in a cave in, of course, Rhodesia. 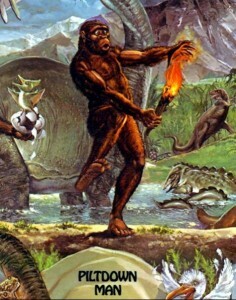 Anthropologists and artists set to work turning him into a half-ape/half-human sort of creature. 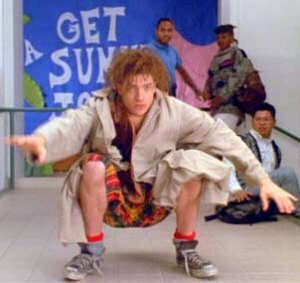 But then a competent anatomist had the opportunity to examine the find, and found that this was just a normal human being. Further analysis revealed dental caries which modern diets tend to produce, and also a hole through the back of the skull made by either a small caliber bullet or crossbow. So Rhodesian Man was not so ancient after all. Taung African Man was found in 1924 by a gentleman by the name of Raymond Dart, when he came across the front face and lower jaw of an immature ape in a cave in the Taung limestone quarry in South Africa. He rushed to report it, accompanied by extravagant claims. 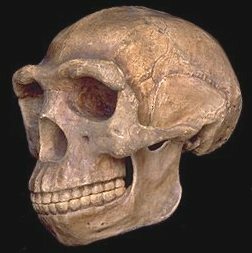 A majority of scientists rejected this find, but the press loudly proclaimed it to be the “the missing link.” Today most experts dismiss it as the skull of a young ape. “Differences due to age are especially significant with reference to the structure of the skull in apes. Very pronounced changes occur during the transition from juvenile to adult in apes, but not in Man. The skull of a juvenile ape is somewhat different from that of Man. 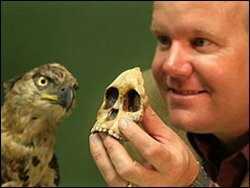 We may remember that the first specimen of Australopithecus that was discovered by Raymond Dart, the Tuang ‘child,’ was that of a juvenile [ape]. This juvenile skull should never have been compared to those of adult apes and humans.” Duane T. Gish, Evolution: the Challenge of the Fossil Record (1985), p. 178. 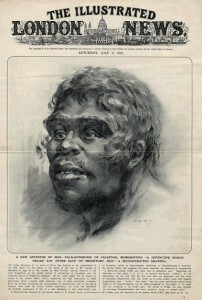 Peking Man also emerged on the international scene in the 1920s coincidentally about the same time that the finances of Davidson Black were nearly tapped out. In 1927 he found a tooth near Peking, China. What a stroke of luck! The Rockefeller Foundation stepped forward and gave him $80,000 to continue research on this colossal find. That is equivalent to around $3.2 million in today’s dollars. So, of course, Black continued looking around and, by another gigantic and unbelievable stroke of luck, came up with a skull, plaster copies of which (or plastic copies of the plaster copies) are displayed in biology labs today. 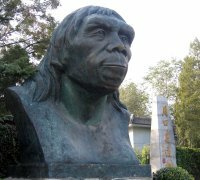 Black named his find Sinanthropus Pekinensis , his authoritatively scientific sounding name meaning “China man from Peking”, and received honors from all over the world for his discovery. After his death in 1934, the very same Jesuit priest who had helped prepare Piltdown Man, Teilhard de Chardin, took over the work at the site. Then Franz Weidenreich led the effort until all work stopped in 1936 with of the Japanese invasion of China. The site turned out to be some kind of weird picnic site or garbage dump. 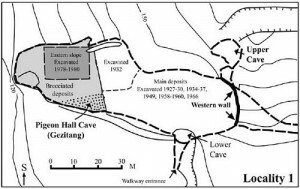 Although thousands of animal bones were found in this pit near Peking, only a few human skulls were found; and there was no evidence that they had evolved from anything else — even though there was 150 feet of animal bones in the pit. These human bones totaled 14 skulls in varying conditions of preservation, 11 jawbones, 147 teeth, and a couple small arm bone and femur fragments, along with some stone tools and carbon ash from fires. Note that Peking Man was represented mainly by skulls — hardly any postcranial material. Not a pelvis or a rib. Not a vertebrae nor a hand bone. Not a foot bone nor a knee cap. Just skulls. The evidence indicates that this may have been a either a dining area or a garbage dump, and that both animals — and people — had been eaten there. The openings at the bases of each skull, called the foramen magnums, had been widened and smashed in, as if someone had wanted to scoop out the brains. So, just what exactly had been excavated? A living site? A burial ground? A place of ritual cannibalism? “The heavy-boned [Peking] hominid skull featured prominent brow ridges and a somewhat smaller braincase (about 1,000 cc.) than modern humans (1,500 cc. ).” R. Milner, Encyclopedia of Evolution (1990), p. 359. These were human bones, but with a somewhat smaller brain capacity, just about 1,000cc., which some people have today. A braincase of 1,000cc. is not sub-human; modern human beings today vary between 1,000 and 2,000cc., with an occasional low of 750cc., and an average of 1,500-1,600cc. The skulls also displayed the familiar prominent brow ridges which we find in Neanderthal, Australopithecus, elderly modern human beings, and some modern Philippine, Black, And American Indian people today. The prominent brow ridge was used in textbooks in the early part of the century to point out how the “lower races” — presumably as opposed to the “favoured” races — were just one step up from apes. “Amidst the uncertainties of war-torn Beijing [then called Peking], it proved impossible to store them [Peking Man bones] safely with Chinese authorities, so Weidenreich finally packed them for military shipment to the United States. They were believed to be aboard the marine ship S.S. President Harrison, which was sunk in the Pacific in mid-November 1941. So Peking man’s bones may now be resting on the ocean’s bottom..” R. Milner, Encyclopedia of Evolution (1990), p. 359. Whatever happened, all the skulls disappeared during World War II, so we cannot now examine them using modern methods to verify their genuineness. It is important to keep in mind that all that remains of Peking Man are plaster casts in the United States. Plaster casts cannot be considered reliable evidence as Piltdown Man dramatically made clear. It is also important, I think, to remember the role Teilhard de Chardin played in the Piltdown Man hoax. In the 1950s, Ernst Mayr invented a new authoritative and scientific sounding name, that of Homo erectus, and then categorized a variety of bone finds into it including Java Man, Peking Man, and several others. The truth is that there have never been any missing links found from monkeys to men. Natural laws and chance alone are not adequate to explain all natural phenomena, up to and including the existence of intelligent life itself. This is a belief that is shared by many rational scientists and many, many people throughout history and around the globe today. The truth is that we are all created from one blood, all nations of men. We were placed here not as a mathematically impossible random act, but as an act of will by a supreme being. You’ve not responded to my comment on vitamin C yet. What are your thoughts? You can try to knock down evolution all you want but all it takes is one piece of good evidence to show that it’s true. I haven’t responded because I haven’t had time to study the issue. However, I will make this observation about this comment. Your logic is exactly backward. All it takes is one limiting factor to show that evolution is NOT true. Thousands of limiting factors exist. My logic is not backwards because I was not talking about limiting factors. I was talking about evidence that evolution has happened. Suppose I have some good evidence that evolution has happened. Surely that would show us that evolution has happened. That seems like very simple and secure logic to me. The fact that you can produce a different argument which sounds superficially similar doesn’t make my logic backwards. Let’s assume that a chessboard is the entire answer and we can only observe part of the chessboard in our investigation. One day we observe a white pawn and we say, “This is evidence that pawns are white!” Then, one day, we observe a black pawn. It simply depends upon interpretation of the evidence. I do my research and present a scientifically sound argument that presents the limiting factor conclusively demonstrating that pawns never change color — that they are always white or always black. That limiting factor handily refutes what you interpreted and presented as evidence. If there is good evidence that something happened, then you have to re-analyze your evidence that there are limiting factors which would have prevented it from happening. Yes, it depends on how you interpret the evidence. Like I said in my vitamin-C comment I use the scientific method to interpret it. What method do you use? As I understand it, the limiting factors are theoretical rather than being based directly on evidence. Maybe Gregg can shed more light on this. Sure. Limiting factors are not theoretical and any single limiting factor is enough to refute the entire theory. Say you were to dive into the ocean and discover an old sunken ship loaded with treasure. Say you theorized that the ship sank in the year 1700 exactly. Then, say I find a coin on board dated 1705, another dated 1715, and another dated 1720. Each single coin becomes a limiting factor that logically refutes your theory. There is simply no way that the ship could have sunk before 1705 since it could not have sunk before that 1705 coin was minted. Likewise, for the coins minted in 1715 and 1720. Each single coin is a limiting factor that refutes the theory of the 1700 sinking and the 1720 coin puts the sinking at sometime after that coin was minted. Suppose, though, that you have an agenda, a motive separate from pure discovery. Since Darwinism amounts to a religious belief, the agenda is always a philosophy of methodological naturalism in the greater religion of secular humanism. This is how Darwinists are able to ignore hundreds — or thousands — of limiting factors that plainly refute their theory. They are able to set aside even simple logic and reason to propogate only “evidence” that supports this religious agenda. I certainly hope this sheds more light. In your ship example you have some hard evidence which refutes the claimed date of the sinking of the ship. Something you can hold in your hand. What evidence do you have that there is a limiting factor in evolution? You don’t have to go into all 1000. Like you say, just one will do. Pick the best one. And of course that is just the way creationist arguments sound to me. I would question whether you can come up with valid limiting factors for biological evolution. I would guess that you could list things you would think are limiting factors (and maybe they are already given in previous posts). I would assume that biologists would think your ideas of limits are not supported by evidence. This example is curious: it seems exactly like the arguments from some creationists about conditions before the Fall or before Noah’s flood. For instance, maybe the rates of radioactive decay were different back then. Good point. I really don’t indulge in those arguments. I was thinking more of the Big Bang arguments about early conditions or the “Gases might have condensed in a vacuum way back then” arguments supporting so-called Stellar Evolution or even the Abiogenesis arguments. Well, of course it is. You have your religion and I have mine. I think the biggest would be observation. Darwinian evolution has never been observed to take place. Observation is, of course, a step in the scientific process. Without observation there can only ever be speculation. Be specific. What do you mean by evolution? Cosmic, Stellar, Chemical, Abiogenesis, or Macro-Evolution? I have no argument with so-called micro-evolution since that is simply changes or variations within kinds and not really “evolution” though the term has been co-opted by Darwinists since it actually DOES occur while the other five do not. Also, I am all for a good debate but I will not be hounded or insulted and I will not engage someone who is disrespectful or condescending. If you are respectful and interested in debate on an equal footing, please continue. Observation isn’t a limiting factor for the processes of evolution actually happening though. The small steps of evolution within ‘kinds’ are the same processes that can lead to species different enough to be classified as different genera or families or ‘kinds’. There is not a limiting factor for those processes between ‘microevolution’ and ‘macroevolution’. I disagree. It is only “not” a limiting factor if you assume that Darwinian evolution occurs. It has never been observed. I think there are two categories here, and what we observe or do not observe is a separate category from potential physical barriers to evolution. I think they could be discusses separately. Well, you asked me for the best limiting factor I could think of and I answered logically that a lack of observation of evolution occuring in the last 5000 or so years of recorded human history is a pretty convincing limiting factor. Go back to the chessboard example. In my faith, I think a creator created the “chessboard” and all the pieces. I think that the creator created 8 white pawns and 8 black pawns and so forth. I think we can only ever observe a white pawn remaining a white pawn. In your faith, you think that the chessboard magically appeared because the early conditions were radically different than present conditions. You believe that a common ancestral chess piece magically sprung into existence through some spontaneous generation that remains utterly unexplained and eventually grew into, perhaps a white pawn. You believe that a white pawn can evolve into, I don’t know, a black pawn or a white knight, then a bishop — or whatever. Maybe we have this entire religion based on really fancy artisitic impressions of nonsense complete with diagrams, charts, and graphs depicting various intermediate rooks and queens and whatnot. But none of that is ever observed. What is observed is a white pawn, for example, is always and only ever a white pawn while a black pawn is only ever a black pawn. So, in my opinion, observation is a pretty gigantic logical limiting factor. What do you mean by a potential physical barrier to evolution? Are you saying there are none? It was actually me who asked you to think of the best limiting factor you could. Your answer is that we haven’t observed evolution happening in the last 5000 years or so. For the sake of argument, let’s assume that you’re right and that evolution hasn’t been observed. We need some common ground for a sensible discussion. As you ask above, I’ll be more specific and say that it’s macro-evolution we’re talking about. I claimed in my comment about vitamin C that we have good evidence that macro-evolution has occurred. It doesn’t give us a direct observation of evolution occurring, but it does give good indirect evidence that it has occurred. In asking for an observation of evolution occurring, you’re asking for good evidence in a particular form. It’s entirely possible that any evolution which can occur over 5000 or so years gets classified as micro-evolution. If that’s the case, we shouldn’t expect to find direct observations for macro-evolution. However, if we do find good indirect evidence that macro-evolution has occurred, we should accept that. Otherwise it wouldn’t be good evidence. The question then boils down to whether the vitamin C evidence is good evidence. The fact that we haven’t observed something (macroevolution) that by its nature we can’t reasonably expect to observe in the short term does not at all show that evolution is not true. It might be a limiting factor for you not to accept it, but that’s a different thing. As Neil said, we have indirect evidence for macroevolution. Since according to the ideas of biological evolution the processes for evolution within species and of different species are the same processes that would be involved in the eventual development of species different enough to be classified into separate families, there is no physical barrier between microevolution and macroevolution. This is a fascinating discussion; forgive me for intruding. After reading the above exchange, and the frequently referenced ‘Vitamin C’ comment by Neil, I get the impression that Gregg’s initial point is getting bogged down by the minutia of this or that. The bottom line for most Information Scientists like me and Gregg is very simple: the extremely complex language and coding/decoding system found within even the so-called simplest of organisms’ DNA, RNA etc., precludes any and all fantasies of self organization. To argue otherwise would defy all established principles of Information Theory. 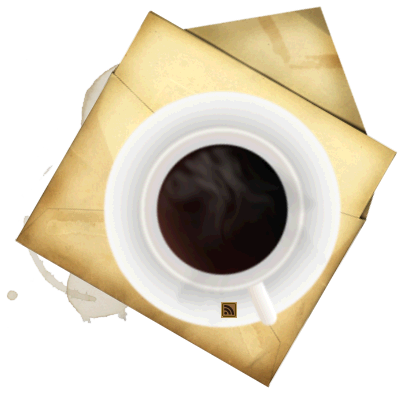 Diminishing the role of the coding process–processes with which all good systems admins and programmers are quite familiar–belittles the complexities involved in its initial creation and subsequent adaptation. Ignoring the brilliance of this coding all-together would be intellectual suicide. The bait-and-switch phenomenon rampant in these discussions does little to advance one’s argument—even to the point of talking past each other. Using words like “evolution” as a catchall to describe the various theories such as “everything from nothing/singularity evolution (cosmic),” to “gold from hydrogen evolution” (alchemy), to “bacteria from rock evolution” (spontaneous generation), even “frog to prince evolution” (macro) confuses the issue; especially when the only true evidence cited is from adaptation through natural selection and LOSS of already existing information. Define terms! Gregg is presenting in this post a very humorous and sobering look at faith in a theory gone awry throughout the years. What one BELIEVES about a specific topic, as Gregg has stated, determines how any evidence is interpreted. If I were walking down the street at night in New York City (I live in another part of Afghanistan from Gregg–I miss streets–even NYC ones–*sigh*) and saw a person with a slim-jim tool attempting to break in to a Porsche parked across the street, what I believe about what is occurring would determine my course of action. Do I call the cops on the scoundrel or help an ill-fated motorist obtain access to his own vehicle? Should I even care? My belief about the evidence I gather in a few brief moments will guide me in my analysis and determine my course of action. Gregg said he would do a post on information and books like those of Meyer and Dembski after he finished his fraud series. But since you’re talking about defining terms, maybe you or Gregg could clear up a point right away about your view on loss of information. Suppose there is a single base pair change in the DNA in an animal’s genome ( for instance, from GACTG to GAGTG). Is this a loss of information because the original sequence is altered and no longer exists on that chromosome? Or is it a gain of information because the animal now has a new and different sequence on that chromosome? Or maybe it is both a loss and a gain? Suppose a gene is duplicated on a chromosome through an error during cell division? Is this a loss of information because the original sequence (one gene) is now altered and lost (replaced by the different sequence of two genes). Or is it a gain in information because the animal now has one extra copy gene on the chromosome? (An extra copy in some locations or for some genes would allow a faster synthesis of the gene’s protein.) Or both? Neither? Welcome to the discussion. Believe me, I don’t think you’re n00bs. If I thought Gregg and you were too ignorant to understand my “enlightened” view, I wouldn’t be here. I apologize for using confusing language at times. I’m quite used to using the word evolution to refer to the evolution of species: micro-evolution and macro-evolution. It’s difficult to remember to be specific every time. I also apologize for using rehashes of tired proofs if I have. I don’t know which proofs you’ve become tired of. I should clarify that although the vitamin C evidence involves the loss of information, it is evidence for macro-evolution rather than micro-evolution because it involves the comparisons of genes between species. This comparison shows us that various primates, including humans, have a common ancestor. I agree that we need a good framework for interpreting evidence. I try to use the scientific method, a method which has given us the understanding to produce modern technology. The photo from Pauli (1949, not 1946, my error in the original) that you identify as three “Philippine women” is identified by the author as three microcephalics (pg. 583). Probably British or American. 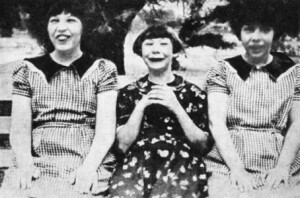 The girls were there to support an argument for eugenics, not evolution. Extremely disagreeable for sure, but not good evidence for your general argument. 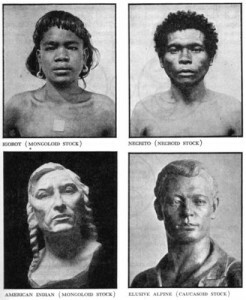 More problematically, the photo from Smith (1943, not 1938), was certainly not placed by the author to illustrate “primitive” and “more highly evolved” races, but was there to illustrate exactly the opposite point. Ella Thea Smith was in fact among the first biology textbook authors to challenge the conceptualization common among evolutionists and creationists alike that the so-called races represented some kind of natural or God-ordained hierarchy. Smith was also among the first to challenge the existence of a natural or God-ordained hierarchy of classes. All this made Smith’s textbook, Exploring Biology, marginally less acceptable with school boards and textbook approval committees … of all stripes. Personally, I find it very interesting that the significantly more eugenic, racist and scientifically out-of-step Modern Biology (1947, 1951, 1956, 1960, 1963 …) was more popular, particularly in more conservative areas of the country. And all that text had to do to curry favor among Christians uncomfortable with the use of the word “evolution” in their kids’ classrooms was use the phrase “racial development” instead. Finally, if I can ask a favor? As you seem to find regular value in my blog, Textbook History, I’d very much appreciate the occasional link. Social Darwinism includes Eugenics. Francis Galton, Charles Darwin’s first cousin, was the father of Eugenics and built on the “new science” of Darwin’s theory. I would be really interested to know the qualifiable or quantifiable basis for this statement since school boards and educational administrators in general are known to be significantly less conservative than the mainstream members of the community in which they serve. It is an interesting opinion. I just don’t find that it is supported by facts or qualifiable/quantifiable evidence. After all, if someone is actually a racist, they automatically are not espousing Christian values. So, the evidence would indicate that someone who teaches or advocates the teaching of racism is not a Christian by definition. Factually, historically, it was Christians who operated the Underground Railroad and who campaigned across the southern United States to end segregation. Those interesting facts are supported by qualifiable and quantifiable evidence and not really a matter of opinion. Thanks for visiting and sharing your rather unique opinions. Please visit again. Gregg, you are absolutely correct. And the ongoing movement toward recognition of and protection for individual civil rights – regardless of race, class, gender, religion, sexual orientation (yeah New York!) – has often, though certainly not exclusively, been driven through our churches (the last one, sadly, not so much). I’ve actually gotten into arguments with secular friends who cannot admit that a Christian minister led the struggle for black civil rights. Many US biologists, conservative and liberal, religious and secular, throughout the first six or seven decades of the twentieth century, held to a belief that physical, emotional and cultural traits were the product of hereditary factors. As a rule, these biologists saw social welfare efforts as challenges to their authority and as competition for their funding. Spending philanthropic and/or tax dollars on the institutionalization of the “feeble-minded” and the criminal, and support for tramps and “reliefers,” was framed not only as a waste of money, but as a “dysgenic” act, weakening the qualities of “the race.” It is an historical fact that “the doctrine of evolution” was forwarded to support this view. 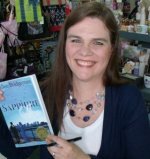 It was argued that dollars needed to be moved out of “womanly” social services and into “masculine” scientific management; that policies had to be written and dollars had to be spent to ensure that fewer children were born into “lesser” families and more were born into “superior” families. Hitler barely made a dent in these beliefs. What did dent, and eventually destroy, eugenics (in the 60s and 70s) were three movements – black civil rights, disability rights and what we used to call “women’s liberation.” Of these, the black civil rights movement was the most important. It became impossible for anyone to support any ideology (or faith) that ordered human beings into pre-determined hierarchies. Though it had been challenged in scientific circles since the 20s, it wasn’t until the end of the 1950s that the “science” that supported racial differentiations finally came under sustained attack. The writing was on the wall by the end of that decade, and both conservative Christians and liberal secularists were forced to rapidly rewrite their histories to distance themselves from proximate racism and exploit the new social landscape. Geneticists erased eugenics from their textbooks (though a few, like the Southern Baptist Bentley Glass didn’t get the message). Conservative Christians erased their very real and very recent support for racial ordering, including their ravenous endorsement of the ideas of folks like Yankee Carleton Putnam (see Race and Reason – big pdf, sorry). Here’s were the genius of Henry Morris emerged. He spotted the weakness in biology’s armor – the racism implied in the continued promotion of eugenics, now called “population management,” by men like Julian Huxley – and adopted the Seventh Day Adventist’s hard creationist line to frame an effective conservative response (Ronald Numbers is really good on this history). Morris took race off the table. By doing so, with “The Genesis Flood” in 1961, and the I believe even more important “The Twilight of Evolution” in 1963, Morris allowed conservative Christians to get the jump on secularists with a solid critique of an ideology – hereditary determinism – many liberals didn’t even know the theory of evolution was being used to support. But as there were precious few real “good guys” in our country’s racist past, there are no real winners in our increasingly polarized present. Secularists tend to frame Christian values as the weapons of reactionaries, Christians tend to frame science as a foreign agent, or the Devil incarnate. Maybe there is no other way. Regarding your insistence that I offer a qualifiable or quantifiable basis for my arguments, the best source is my blog, Textbook History. There I publish not only my “opinions,” such as they are worth, but original quantitative and reasonably evidenced qualitative studies based a pretty decent data set – over 100 American biology textbooks published between 1907 and 1970, and many dozens of supporting studies and documents.